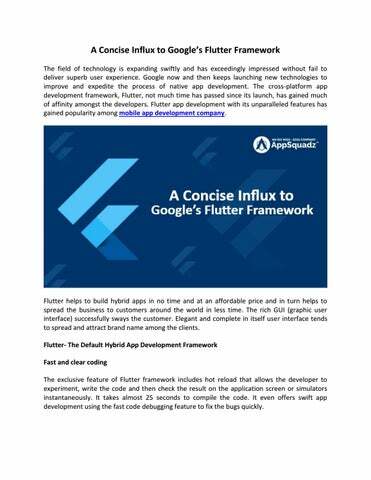 A Concise Influx to Googleâ&#x20AC;&#x2122;s Flutter Framework The field of technology is expanding swiftly and has exceedingly impressed without fail to deliver superb user experience. Google now and then keeps launching new technologies to improve and expedite the process of native app development. The cross-platform app development framework, Flutter, not much time has passed since its launch, has gained much of affinity amongst the developers. Flutter app development with its unparalleled features has gained popularity among mobile app development company. Flutter helps to build hybrid apps in no time and at an affordable price and in turn helps to spread the business to customers around the world in less time. The rich GUI (graphic user interface) successfully sways the customer. Elegant and complete in itself user interface tends to spread and attract brand name among the clients. Flutter- The Default Hybrid App Development Framework Fast and clear coding The exclusive feature of Flutter framework includes hot reload that allows the developer to experiment, write the code and then check the result on the application screen or simulators instantaneously. It takes almost 25 seconds to compile the code. 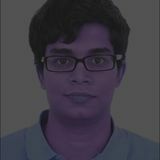 It even offers swift app development using the fast code debugging feature to fix the bugs quickly.